'We have a very good relationship. He (Kim) likes me, I like him,' Donald Trump told a press conference in New York. 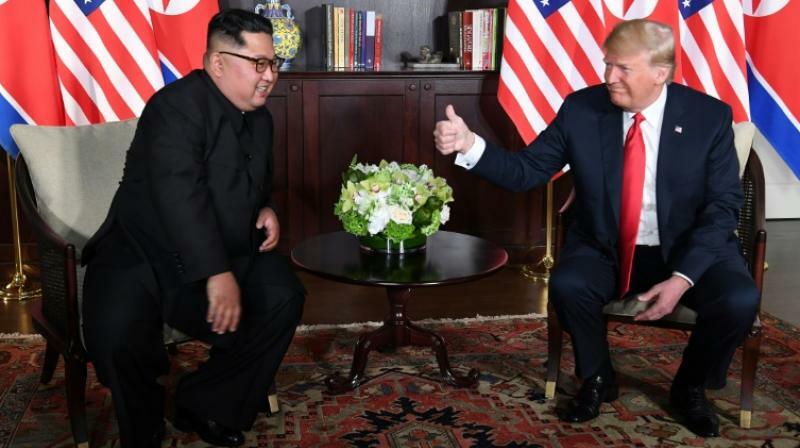 New York: President Donald Trump said Wednesday the US would have been drawn into a war with North Korea if he had not been elected as he played up the prospects of a peace deal with its leader Kim Jong Un. "If I wasn't elected, you would have had a war," Trump said before adding that "nobody is talking about that" anymore. "We have a very good relationship. He (Kim) likes me, I like him," he told a press conference in New York. "I really believe he wants to get it done. He wants to make a deal, I want make a deal." Trump, whose Secretary of State Mike Pompeo is due to travel to Pyongyang next month, refused to commit to a timetable on when he expected North Korea to denuclearize. "I don't want to get into the time game. You know why? I told Mike Pompeo. I said 'Mike, don't get into the time game.' We stopped him. They're taking down plants, they're taking down a lot of different testing areas. "They're going to take down some more. You'll be hearing about that very soon. I don't want to go ahead of myself. But you'll be hearing about it soon."